100 meters from the beach & 1 min from restaurants, shops. Awarded certificate of Excellence 2018 on TripAdvisor. Broadstairs has been voted "THE BEST SEASIDE TOWN" in the South East to come and stay! The cottage has been recently refurbished to a very high standard and is the sister cottage to Nickleby’s Nook. No internal photographs are available at the moment but the layout is identical to Nickleby’s Nook. Built in around the 1860's, is set in a quiet courtyard called Church Square. A lovely atmosphere has been created in this cottage with added beams through out the cottage, for that cosy warm feel and including in the decor are old pictures of the harbour and Charles Dickens characters on the walls. 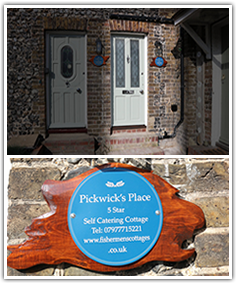 Pickwick's Place, Church Square has two bedrooms and can comfortably sleep four people. The cottage is approached from the communal square and up 2 steps to the front door which is on the first floor. You walk straight in to the lounge where there is a comfortable sofa, two armchairs, a TV with Freeview and a electric log burner, WIFI is also included. Spiral stairs lead down to the well-lit basement kitchen which is fully equipped for all your culinary needs. It has a dining table which comfortably seat four people for dinner. In addition, the kitchen also has a washing machine. On the second floor you will find the second bedroom with two single beds and a separate bathroom with shower, toilet and basin. The main bedroom is on the third floor and has a luxurious king-size bed. You will be guaranteed a warm and friendly welcome whenever you come to Broadstairs. The town is steeped in history and charm and has been captivating visitors for generations. The cottage is a fantastic base from which to explore everything the town and surrounding area has to offer. There is free parking for your car on the Eastern Esplanade. This is only a couple of minutes' walk away from the cottage and close to the famous Bleak House where Charles Dickens wrote some of his novels. Just park your car and enjoy the history and beauty of this wonderful old town and its surrounding areas. If you prefer to walk or cycle, there are some of the best cliff top walks you will see that should not be missed and is famous for its spectacular sunsets, 7 golden beaches and panoramic views you will find in Great Britain, these include Viking bay, Joss bay, Botany bay and there are smaller more secluded beaches if you prefer. If you fancy a game of Golf on our famous golf courses, or a day out boat fishing, or even a trip to France for the day it is all here. Being right on the tip of the South East of England, we have our own little micro-climate here producing some of the best weather in the UK. You will be guaranteed a warm and friendly welcome whenever you come to Broadstairs. With so much charm and history in this picturesque town, how could you resist? The summer season offers great attractions, including the famous Folk week that have captivated generations of visitors, year after year, from all over the world. Our GDPR compliance is currently being written, you can be assured that any details collected either by enquiry form or through the booking system are kept safe and secure and we do not share any information with any third party. The data we collect is used only by us for contact purposes.